This morning, I left the house without an umbrella, even though I spent time and money yesterday afternoon procuring a brand new umbrella – leopard print with maroon accents – at the Walgreens in Union Square. I left the house without an umbrella because at the moment I left the house, it wasn’t raining. Another reason that I left the house without an umbrella is that I left the umbrella that I purchased yesterday at the office in the bottom drawer of my desk, nestled between a half-eaten box of Kashi Go Lean cereal and a bottle of wine. I could have stolen an umbrella that’s hanging from the coat rack in the entryway of my apartment. But I didn’t. I thought it might be my roommate’s and I didn’t want to steal an umbrella that she needed later. And so, I left, hoping that the rain would hold off – according to my weather app, there was only a 30% chance – at least until I got to work. I was not always so unprepared for the rain. 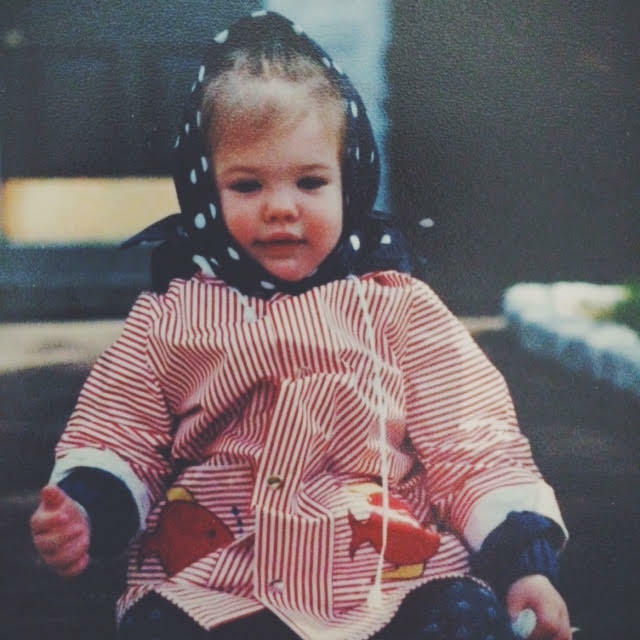 Here I am, age 2, ready for spring showers. My hope was dissolved within the first block of my walk, when I started to feel fat rain drops fall on my already-wet hair. (Sometimes I’m just too lazy to dry my hair in the morning, as was the case this morning.) I started walking faster, my feet heavy in brand new Birkenstocks, which I hoped would not be damaged by the rain. I briefly considered turning back to steal the umbrella from the coat rack before letting optimism get the better of me. I told myself that the rain would surely stop soon. By the time I got to the first major intersection on my route, the rain had become a torrential downpour. I stood on the corner, umbrella-less with only a jean jacket to shield me, looking down as the rain filled up the comfortable footbeds of my sandals. Veruca Salt’s ‘Spiderman ’79’ played through my headphones. I walked the next three blocks alongside other people who had umbrellas and one man in a hooded, waterproof raincoat. I felt like a dunce. When I arrived at the second major intersection, where my subway stop is, I waited to cross the street under the overhang of a deli called Lite-Bites with two other drenched dunces. The light changed and I ran across the street to enter the subway, my feet making a loud squishing sound with every step. As soon as I got through the turnstile, I took a small mirror out of my purse and examined my face. My mascara had smudged both above and below my eye. I fixed it as I walked down the platform, where all of the people waiting for the train looked very dry. I remained conscious of looking as though I’d showered with my clothes on throughout my commute. Catching my reflection in the windows of the L, the G, and every store I passed once I got to (very sunny) Union Square, I saw my hair plastered to my head, the knees of my pants sagging, the dark spots that had formed on my sweater. When I stopped to get coffee, I thought the barista gave me a look like, Why do you look like that?, but that also could have just been the way he looks at every customer. In the office, I stripped off my jean jacket and sweater, brushed my hair, and commenced drying off. This process took close to three hours. I later found out that many of my co-workers didn’t even know that it had rained.